 CGI walk around the world 2018 donations went to Techfugees France, thank you! This year, CGI France decided to support Techfugees France during their annual walk around the world #CGIWAW2018! As a result, last Thursday hundreds of people walked in different cities and donated 2000€. Thank you to all who walked!  Merci et Bravo à tous les professionnels de CGI qui se sont mobilisés pour la #MarcheautourduMonde en France et dans le monde !  Have you heard of PLACE Network? This weekend we were excited that the latest PLACE Lab was organized in Paris @halles_civiques! PLACE Network is a project led by a European collective that aims to show how #migration is a source of #innovation for host societies. Their project has been pre-selected through the Techfugees Global Challenges. The 25 best projects, announced on October 4th, will be pitched on stage at the Techfugees Global Summit on October 26th, at Station F.
Techfugees France will be at France Digital Day where all the players from the Tech ecosystem meet in Paris on September 25th. Ping the team if you’d like to meet or to say hi! 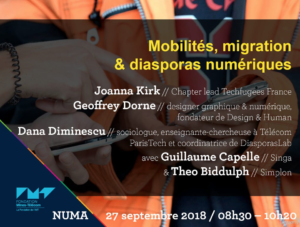 Also upcoming, Techfugees France’s Joanna Kirk will be speaking at the last of a series of 4 events organized by the Foundation Mines-Télécom, 27 September, 8:30 to 10:30am at Numa, 39 rue du Caire, Paris. Entrance is free for those wanting to join. The session will focus on mobility, migration and tech communities with other guests including Geoffrey Dorne, Founder Design & Human; Dana Diminescu, sociologist, teacher/researcher at Télécom ParisTech and coordinator at Diaspora Lab; Guillaume Capelle, Founder of Singa and Théo Biddulph from Simplon. ‍♀️ Want to get involved, meet or partner with us? We have exciting projects coming up including a next hackathon (more to be announced soon); second edition of the Techfugees Women Fellowship; several awesome partnerships and events coming up; meetups at Liberty Living Lab; special event at Station F and the Techfugees Global Summit.